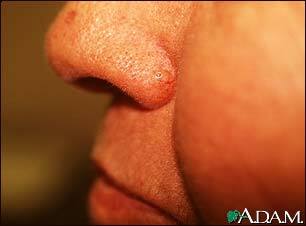 A basal cell carcinoma near the tip of the nose is shown here. This lesion has a pearly, slightly raised border, and would likely bleed easily if traumatized. Updated by: Richard J. Moskowitz, MD, dermatologist in private practice, Mineola, NY. Review provided by VeriMed Healthcare Network. Also reviewed by David Zieve, MD, MHA, Isla Ogilvie, PhD, and the A.D.A.M. Editorial team. Editorial update: 03/09/2016.